Though it comes with the undesirable label of being James Gandolfini’s final screen appearance, “The Drop” has all the makings of a dark horse awards contender. Adapted by esteemed crime writer Dennis Lehane from his short story “Animal Rescue,” the movie doesn’t have the same cynicism as past adaptions of the author’s work (“Mystic River,” “Gone Baby Gone”), but it’s a grimy little crime drama that harkens back to the great Sidney Lumet films of the 1970s. This is a movie that places mood and character above all else, and while that might not be everyone’s cup of tea, Michaël R. Roskam’s “The Drop” is a well-paced and expertly acted film that serves as a fitting end to one actor’s career and the exciting emergence of another. Tom Hardy stars as Bob Saginowski, a quiet, well-meaning bartender at the Brooklyn watering hole previously owned by his cousin Marv (Gandolfini), who still runs the day-to-day operations. But while Marv is the face of the business (his name even adorns the outside of the building), it really belongs to a group of Chechen mobsters that use it as one of the city’s many drop bars, a place chosen at random to hold all of the day’s illegal bookmaking money. When the bar is robbed by some amateur thieves, the two cousins are put in charge of finding those responsible, leading Marv (who helped plan the whole thing) to resort to desperate measures. Meanwhile, Bob finds a wounded pit bull in a trash can and decides to adopt it, but when the previous owner (Matthias Schoenaerts) resurfaces looking for trouble, he must decide how far he’s willing to go to protect the mutt and the woman (Noomi Rapace) helping him care for it. The dog subplot may seem like it comes a bit out of left field when compared to the more traditional crime elements of the movie, but it ties nicely together into the main story and goes a long way in fleshing out Hardy’s character. Bob is either a little dim-witted or the smartest person in the room, and that’s part of the brilliance of Hardy’s performance, because you can never really tell for sure. As one character remarks, Bob is the kind of guy you don’t see coming – the silent but deadly type that only acts when absolutely necessary – and although it’s an unusually subdued turn for the actor, it’s one of his best performances to date, more impressive by the minute as he carefully peel backs each layer. Gandolfini also shines as the wannabe tough guy who thinks he deserves more respect than he gets, a dinosaur still living in the past, while Rapace and Schoenaerts (the star of Michaël R. Roskam’s Oscar-nominated debut, “Bullhead”) round out the excellent cast with equally solid performances. 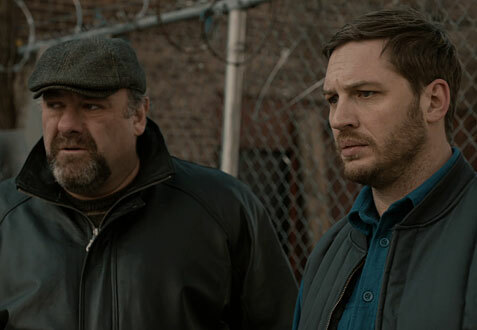 But for as great as it is to watch Gandolfini doing what he does best in his last film role, “The Drop” is Hardy’s show through and through, and it could finally land the actor his first major nomination after years of delivering quality work. Of course, Roskam and Lehane deserve a lot of credit as well for their respective parts in crafting the movie, because even though it hits all the familiar beats of a slow-burning crime thriller, there are just enough small nuances that allow it to stand on its own. Some of the subplots aren’t explored as much as they could have been, but the film is pretty unique in that, despite featuring its share of nasty characters, it’s more interested in the innocent ones (from Bob, to Rapace’s Nadia, to Rocco the dog) that exist within the criminal world. That ultimately makes for a richer and more interesting drama, especially when everyone involved is at the top of their game like they are here. 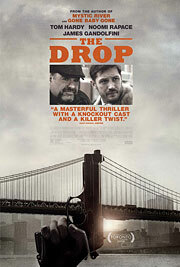 Hollywood doesn’t make too many movies like this anymore, but “The Drop” is a perfect example of why it should.